BEAST Butcher and Block will be located at 4156 Manchester, next to Atomic Cowboy. Big news for barbecue lovers and the legions of BEAST Craft BBQ (20 S. Belt West, Belleville, IL; 618-257-9000) fans who've lamented the trip east for a taste of its killer food: The acclaimed Belleville smokehouse will open a second location, this time in the Show Me State — and it's pitmaster David Sandusky's most ambitious project yet. 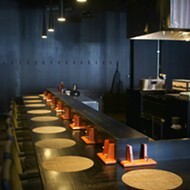 The new restaurant, BEAST Butcher & Block, is slated to open late this summer at 4156 Manchester Avenue in the Grove. As Sandusky explains, the new location will have the soul of the original BEAST, but will take that as a jumping-off point for a much grander concept. "This is not going to be a carbon copy," says Sandusky. "Meggan [his wife and business partner] and I will be taking a few of the core elements from BEAST — there will be the pork steak, the Brussels sprouts, the Compart Farms pork and Wagyu beef — but we are going to add a few things and do things slightly differently." "Slightly differently" scarcely conveys the full nature and scope of the Sanduskys' plans for BEAST Butcher & Block. 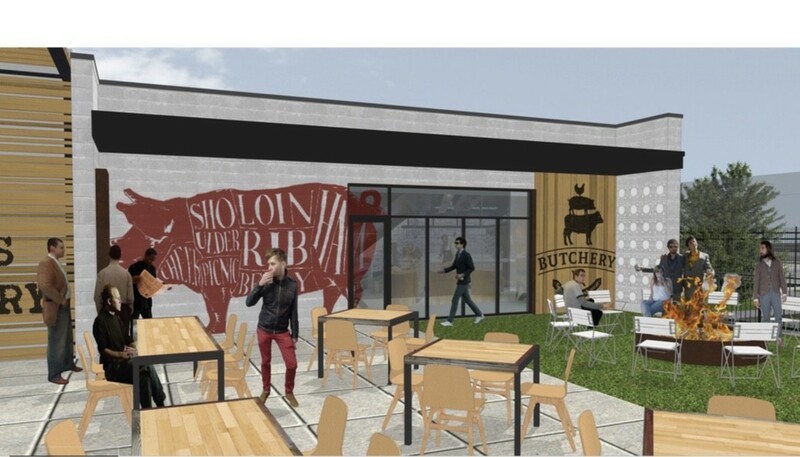 The 6,000-square-foot space will house multiple elements under one roof: A 100-seat fast-casual smokehouse, similar in format to the original BEAST; a 25-seat patio; a retail, whole-animal butcher shop with an accompanying outdoor courtyard lounge and firepits; and a hybrid chef's table-research and development space called the Skullery. An artist's rendering of the BEAST complex. "It's very ambitious," Sandusky admits. "We're really limited with what we can do in Belleville. We have a huge fan base in Missouri and they hate driving to Illinois. Plus, we are limited in what we are able to accomplish in terms of national recognition in Belleville." The Sanduskys are working with local firms JEMA and Blackline on the design and buildout of the space and with Narrative Furniture on custom-made tables and chairs for the restaurant. In addition to serving as a chef's table and R&D area, the Skullery will also serve as the branding for a line of sauces and rubs Sandusky is developing for retail. 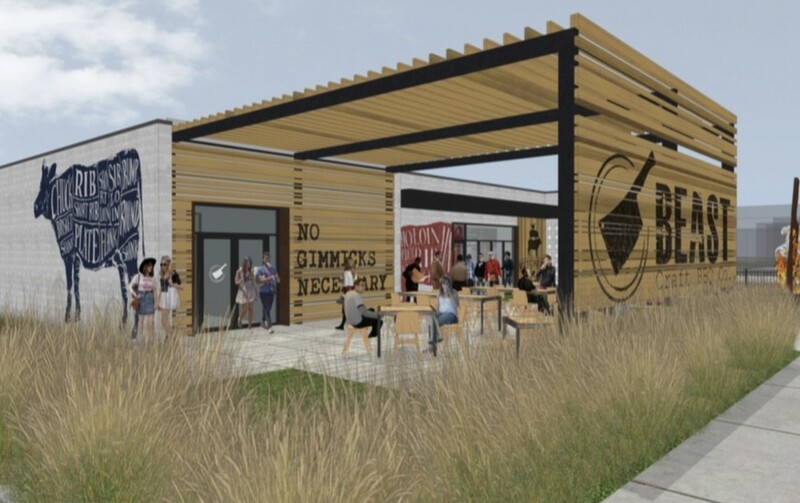 The Sanduskys also envision it as a collaboration space for anything from beer dinners with local breweries to a venue for showcasing the area's culinary talent. Expect collaborative dinners with other local chefs, special events and even a radio show and podcast broadcast from the Skullery. "People ask if St. Louis needs another barbecue restaurant, and the answer is 'No,'" says Sandusky. "But does it need another great barbecue restaurant? The answer is 'yes.' St. Louis is putting itself on the maps as one of the premier barbecue cities in the country, and we want to be a visible part of that." Dave Sandusky will open BEAST Butcher and Block in the Grove late this summer.